Untitled set piece for The Firewall Grove (2017-2018) 3d scanned, printed and cast architecture elements, polyutherthane, epoxy, polyester-fiberglass, laser cut mdf, various automotive paints and fillers. In this sprawling film work, a small sect has locked themselves inside a compound to shelter from an ambiguous attack happening outside. When a stranger arrives seeking refuge, the group’s prophecies begin to unfold. This latest film by Riley Harmon forms the conceptual sequel to his critically acclaimed work ‘A Method for Blue Logic’ (2014) in what will become known as the terror management series. 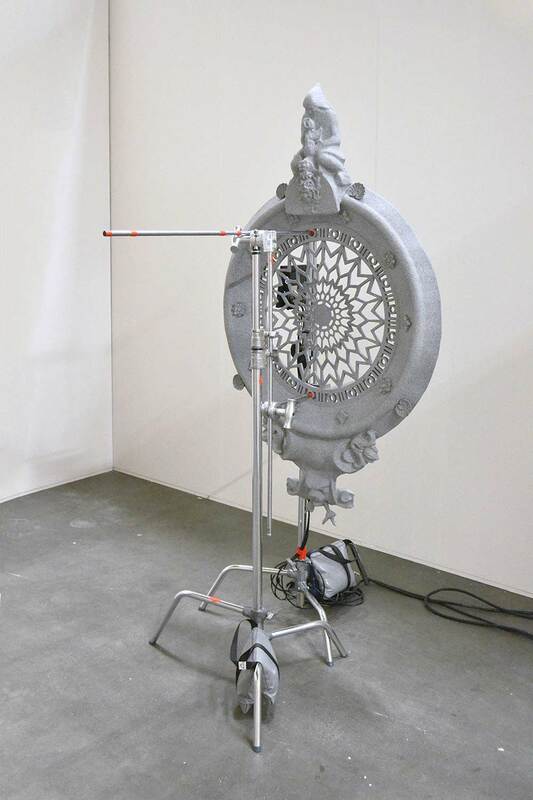 Set pieces for the film and other performances were made by 3d scanning architecture elements from around the world and mutating the designs of various rose windows.